progressive agriculturist and successful business man who has won a foremost place among his felowmen [sic] and enjoys the respect and confidence of all with whom he comes in contact. Mr. Wedekind is a native of Saxe Province, Germany born April 21, 1856, where he grew to manhood, following the occupation of a miner in that country from 1870 until 1882, in which year he embarked from Hamburg on an emigrant ship bound for America. Immediately after landing he struck out for the west, arriving in Sarpy county, Nebraska in 1883, where he remained and rented, also working as a farm laborer up to February 15, 1892, at which time he moved to Madison county. Here he bought the Bryer homestead, and during the first two years succeeded in improving the place to some extent, having fair success with his ventures, but in 1894 his crops were totally destroyed by the hot wind storms which swept the region. Other years he suffered loss from various causes familiar to nearly all of the early settlers in that section, but he persevered through it all and finally, was able to raise good crops of grain, etc., and also engaged in stock raising, so that he was on the high road to prosperity, adding to his original farm many acres, and is now the possessor of one of the valuable estates in his county, owning four hundred and eighty acres. January 1, 1888, Mr. Wedekind was united in marriage in Sarpy county, to, Miss Helen New Yoke, and to them have been born the following children: Gustave, Henry, Emma, Anna, Otto, Iberg, Wilder and Arthur, all fine sturdy descendants of worthy parents, and of great help to them in carrying on the farm. They have a very comfortable home, and are popular members of the social life of their community. George Nelmes was one of the very early settlers of Custer county, Nebraska, and has been very successful as a farmer and stock raiser, having now retired from active life. He was born in Herefordshire, England, July 9, 1842, a son of Nathaniel and Martha (Sebon) Nelmes, being the third of their eight children. Both parents died in England, and, besides George, their only surviving child is a daughter now residing in Des Moines, Iowa. Mr. Nelmes received his education and reached maturity in his native country and later engaged in farming. In 1866 he married Mary Morgan, also a native of England, who died in 1881, being survived by her husband and the following six children: Elizabeth died in 1892; James, married and living two and one-half miles south of Ansley, has two children; Pearl, wife of E. L. Ceveland, of Callaway, Nebraska, has three children; Martha, wife of Sidney Belcher, of York, Nebraska, has three children; Lulu, wife of Walter Baker, of Westerville, Nebraska, has four children; Gertrude, wife of Frank Buckner, living near Westerville, has three children. In 1887 Mr. Nelmes brought his family to America and spent seven months in Wisconsin, after which he came to Nebraska, rented land in Custer county for several years, and then purchased one hundred and sixty acres of land, to which he later added two hundred and forty acres, and he has spent ten years on this place. In the winter of 1909 he retired from the farm and moved to Ansley, where he purchased a good home. He is a self-made man and won his way to success through many difficulties. He owns four hundred acres of fine farming land, and is recognized as a public-spirited, desirable citizen. Mr. Nelmes was married (second) on November 1, 1894, to Mrs. Mary Edwards, also of English birth, who came to America in that year. One son has been born to this union, Edward, who is at home. Mrs. Nelmes had four children by her former marriage: George, of Custer county, married and has one child; Ernest, in Wyoming; and two sons who are married and live in England. The parents of Mrs. Nelmes died in England, and she has three brothers in that country and one brother in Chicago, Illinois. Among the younger farmers of Wayne county, Nebraska, a prominent place is accorded the above named gentleman, who is one of the most successful and progressive in this section. He has been a resident of this county for nearly thirty years, and during his long residence has made many friends, and has also gained an enviable reputation as a public-spirited citizen. Mr. Longe was born in Iowa, in 1875, and was the son of Frank and Gusta Longe. His parents were of German birth, and left their native country in 1871, coming at once to Iowa. They remained here until 1880, when they removed to Cuming County and rented land until 1883. They moved again at this date, this time locating in Wayne county, where the elder Longe bought a farm of eighty acres from the railroad, paying three dollars per acre. Later he added to his first purchase until he owned two hundred acres. tracts attention even when afar off, is the fine grove and orchard which were planted some years ago and are now in their prime. In 1898, Mr. Long [sic] was united in marriage to Miss Amelia Kay and of this union six children have been born, named as follows: Clara, Alvana, Mata, William, Otto and Harry. Mr. and Mrs. Longe are members of the German Lutheran church and he is a republican. He has been for ten years moderator of his school district. John F. Campbell of Palmer, Nebraska, formerly a resident of section eight, township fourteen, range eight, Merrick county, is a well known pioneer of eastern Nebraska, settling in this part of the state in 1874. He was born in Porter county, Indiana, on April 2, 1840, and is a son of Samuel and Elizabeth (Frame) Campbell. He was sixth in a family of seven children, one brother of whom resides in Nebraska, as does also a sister; two sisters reside in Indiana; and one brother and one sister are deceased, as are also the parents; the father died January 20, 1884, and the mother died in March, 1895, both in Indiana. Our subject received his education in the home schools, and later engaged in farming. On February 22, 1865, Mr. Campbell was united in marriage to Miss Matilda Penrose, of Knox county, Ohio, and later of Indiana. In the spring of 1874, Mr. Campbell with his wife and four children came to Merrick county, Nebraska, and homesteaded eighty acres of land in section eight, township fourteen, range eight, west, where he lived for five years; then purchased one hundred and sixty acres adjoining the homestead, and moving on to the same, building a good house, and adding other improvements. Mr. and Mrs. Campbell have had nine children: Elmer, who is married, has seven children and resides in Burwell, Nebraska; Etta, wife of William Bice, has two children and lives in Merrick county; Nancy, wife of Peter Petersen, has six children and resides in Burwell; Mary, wife of John Coolridge lives in Merrick county and has one child; Clara, wife of James Klye has four children and resides in Merrick county; Andrew, married, has two children and resides in Wolbach, Nebraska; Laura, wife of Edward Terry, has five children and lives in Scotia, Nebraska; Myrtle, who resides at home; and Delbert who is married and lives on the home farm. Mr. Campbell has been prosperous and successful, and from time to time has purchased land, and now owns four hundred acres of fine stock and grain land. He was instrumental in organizing his school district number forty-one, and served as director of same for a number of years. Mr. and Mrs. Campbell. are among the earliest settlers of the county, and have passed through all the discouragements and trying experiences incidental to frontier life, and are widely and favorably known. John G. Scherer, manager of the Wm. Krotter Company's lumber yard at Butte, Nebraska, has been a citizen of this part of the west since the late fall of 1884, when his father, Andrew Scherer, arrived in Fort Randall to take the position of post tailor at the fort. The father was a native of Hesse Darmstadt as was his wife, whose maiden name was Gertrude Bosel; they sailing from Antwerp in June, 1883. On landing in the United States, they came direct to Don Homme county, South Dakota, remaining there until fall, then coming to Fort Randall, as above stated. That was their home for the following five years. At the time of the opening of Ponca reservation for settlement, in 1890, Andrew Scherer secured a claim east of Spencer, Nebraska, where for ten or twelve years he was actively engaged in farming, retiring from active labors in 1902. He now resides in Spencer, has a comfortable home and is enjoying the fruits of his many years of hard work and perserverance. Our subject was born in the village of Abenheim, District, of Worms, Hesse Dormstadt, Germany, on April 24, 1869. and there as a boy attended the parochial schools until coming to America, from then on his education being sadly neglected, except what was gained through reading and observation. He subsequently became familiar with the Indians at the fort, learned their language and slept in their tepees with them many a night, being a general favorite, and this friendship has endured through all his life. He remained with his parents until the age of twenty-three, then filed on a homestead situated three miles northwest of Bristow, residing on it the required five years, after which he sold the land and moved to Tripp county, South Dakota. herded cattle for the contractor who furnished beef to the Indians for three seasons, returning Boyd county in 1900. He bought a farm near Butte, which he tilled for four years, then gave up work and took charge of the Krotter lumber yard and implement house. Since his installation as manager of the concern, its patronage has been extended considerably, due to his business sagacity and enterprise, their trade being drawn from the entire northern part of Nebraska and south, Dakota. Mr. Scherer was married at Spencer, on June 8, 1893, to Miss Clara M. Kloke, and to them have been born seven children, named as follows: Irene, with the telephone company here, and Arlie, in the same employment at Fairfax, South Dakota; while Gus, Albert, Gertrude, Fritz and Andrew are still in school. throughout their community. He is a republican in politics, and fraternizes with the Modern Woodmen of America; also holds memberships in the Des Moines Bankers' Accident Association and the Business Men's Accident Company of Des Moines, Iowa. David Whitten, one of the oldest settlers of Midland precinct, has the honor to be one of the highly intelligent and worthy citizens of Boone county, and as such has gained a host of friends during his residence in the region. He has made a life study of farming and stock raising, and has been more than successful along both lines, now being classed among the wealthy and progressive residents of his section. Mr. Whitten was born in Ireland, and grew up there, coming to America about 1857. David was the third in a family of ten children born to Moses and Catherine Whitten, all coming to America at different times, our subject being the first to emigrate, he starting out for the new world alone at the age of sixteen years. His first location was in Ulster county, New York, where he remained for a couple of years, dividing his time between there and the state of Georgia, working in New York state during the summers, and in winter going south. In 1863 he came west, locating in Henry county, Illinois, and obtained employment on a farm there. In July of that year, he was married to Mary B. Hall, who is a native of England, coming to this country with her parents when a small child. Three children were born to them in Illinois, and in the fall of 1871 the entire family started for the far west, travelling overland by wagon and team the entire distance, and having for their destination Boone county, Nebraska, which they reached safely after a long and tedious journey fraught with many interesting incidents. Mr. Whitten filed on homestead rights in section twenty-six, township twenty-one, range six, and since the time of locating here, that place has been his constant home. His family was the first to settle in this portion of Boone county, and "Whitten's Valley" is a familiar name to all living anywhere near to that region. Mr. Whitten has made a life work of farming and stock raising, as stated before, and has met with splendid success in both lines. With his family he has passed through all the pioneer days of Nebraska, and often endured hardship and privations that are the lot of the early settler in a new country. He has always been active in promoting the general welfare of his community, and had done much to aid in the development and advancement of his county and state. Mr. and Mrs. Whitten have had ten children, nine of whom are now living, named as follows: Mary Jane, who married Henry Moyer, they living in Boone county; Hannah, wife of John Nieman and residing in Clay county; George, who lives on the home farm; William, May, a teacher; David F., who married Adeline Belgum, on September 10, 1908; Edward Leroy, Arthur, and Ella Althea. The Whitten family are among the prominent members of the social life of their community, and are held in the highest esteem as being almost the only remaining family of really old-timers in their immediate neighborhood. Many a pioneer has come to the western. plains with nothing but a strong heart and willing hands, and from a start of nothing has carved out for himself a fortune and home, and is now prepared to enjoy the remaining years of his career in comfort and plenty surrounded by his family and a host of warm friends, esteemed and respected by all. Mr. Shroder was born in St. Megalis Donn, Holstein province, Germany, in November 28, 1853, and was brought up by Henry Peterson. After our subject grew to manhood he served in the German army three years. In 1885 Mr. Shroder came to America, starting from Hamburg, sailing direct to New York, bringing his family with him. After landing in the United States, our subject and family stopped for a few days in Keystone, Iowa, then going to Douglas county, and in 1881 to Washington county, Nebraska. Here they went through about all the hardships and drawbacks incident to those times, among other experiences being hailed out in 1898; and in the blizzard of 1888, our subject with his family became lost in the storm, barely escaping with their lives. In 1903 Mr. Shroder sold his Washington county home and came to Antelope county, where he owned a beautiful improved farm of two hundred and forty acres, with eight acres of good orchard and grove trees. Mr. Shroder was united in marriage in 1877 to Miss Dora Kruger. Fifteen children have blessed this union, being named as follows: Peter (deceased), Ernest, Annie, Bertha, John, Henry, Dora, Minnie (deceased), Olga, Lena, Emma, Hans, Nannie, Elma, and Ella. For some time Mr. Shroder lived on section fifteen, township twenty-seven, range six, but recently he sold this place and bought a farm of one hundred and sixty acres in section thirty-five, township twenty-eight, range six. This is a splendid farm, highly improved, and a comfortable home, with modern improvements. Mr. Shroder and his family are highly respected in the community in which they live. very influential in promoting the general welfare and progress. He was born in Pennsylvania, October 20, 1858, the eldest of the seven children of Jacob F. and Catherine Mauk, the father a native of Wurtemberg, Germany, and the mother of Pennsylvania. Jacob F. Mauk was born in August, 1836, and came to America in 1851, settling first in Cumberland county, Pennsylvania, where he was married in 1857 to Catherine Shireman. The Shireman family had been living in Pennsylvania since the Revolutionary war. In 1863 Mr. Mauk enlisted in Company C, Third heavy artillery, serving until the close of the war. He was one of the guards detailed to guard Jefferson Davis after his capture. Jacob F. Mauk was a mechanic in early manhood but after the war removed with his family to a farm in McLean county, Illinois. They lived there until October, 1880, when they removed to Custer county, Nebraska, and took up a homestead, on section ten, township sixteen, range twenty, there being five children in the family when they made this change. The trip was made with teams and covered wagons, and when they reached their destination they lived for some time in a sod shanty. Mr. Mauk lived on his homestead farm until 1897, then moved to Broken Bow and made that his home until his death, August 6, 1910, his wife having died on the farm in 1886. He was one of the honored pioneers of the county, and the family was widely known. Of the seven children born to Jacob F. Mauk and wife four survive them: William H., Frank E.,. Mrs. C. T. Wright and Mrs. Carl Burdick. William H. Mauk, the principal subject of this article, came with his parients [sic] to Illinois, and there grew to manhood. He made a trip through several of the western states in 1877, using a team and wagon for transportation. He visited the Black Hills, Wyoming, and Colorado, and while at the first named place worked as stock tender for the Black Hills Stage Company. When his father moved to Custer county he left this occupation and came to join the family, taking up a homestead and tree claim on his own account, on sections fourteen and fifteen of township sixteen range nineteen, in May, 1881. He is one of the very few men coming to the county and securing a homestead at so early a date as 1881 who retains the ownership of homestead and timber claim. After residing on his homestead farm for a period of twenty-four years, he moved to his one hundred and seventy-seven acre farm near Broken Bow. He owns other land as well and is a successful and progressive farmer and stockman. He has a well-equipped stock and grain farm and has always stood for the best interests of his community. He has given his time and means toward the development of his county and state and is regarded as a public-spirited citizen. In early days he experienced the same trials and privations as his neighbors, and triumphed over all difficulties. He has served on the township board and in his earlier years in the county was justice of the peace in his district. Mr. Mauk was married (first) in March, 1884, and of this union four children were born: Edward, Hattie, Esther, and Oscar, all of whom have received excellent educational advantages. Edward is unmarried and is a homesteader of Brown county, Nebraska; Hattie J. is a member of the faculty and corresponding secretary of Lincoln business college; Esther graduated from the high school of Broken Bow with the class of 1911, and Oscar is a student in the high school. In 1905 Mr. Mauk left his farm and located in Broken Bow, so as to afford his children better educational facilities, and that place has since been his home. He was married (second) August 15, 1905, to Miss Katie Bushman, of Carlisle, Pennsylvania. Mr and Mrs. Mauk have a modem comfortable home, and are well-known, in social and educational circles. Mr. Mauk is a member of Masonic orders, and he with his wife, belongs to the Eastern Star. The late Adam F. Hannawald, an early settler of Custer county, and well-known as a man of strict integrity and high character, did much to influence the early development of Custer county and central Nebraska, and his death was deeply deplored by his many friends. He was a veteran of the civil war and throughout his life was known as a patriotic, useful citizen. He was born in Utica county, New York, September 28, 1836, a son of Adam and Dorothy (Shingler) Hannawald, and the oldest of their six children. He has a brother in Denver, Colorado, and another brother, Martin, in Bridgeport, Nebraska. Mr. Hannawald grew to manhood on a farm in New York and received his education in local schools, later engaging in farming on his own account. He was married in Madison county, New York, January 29, 1859, to Anthy L. Owen, also a native of that state. On August 7, 1862, Mr. Hannawald enlisted in Company B, One Hundredth and Fifty-seventh New York Infantry, and owing to physical disability was discharged on February 8, 1863, and then returned to his home, and resumed farming in his native state. children; Ettie M., wife of L. J. Read, of Merna, has two children; Nettie, wife of Archie Meek, lives in Anselmo, Custer county. Mrs. Hannawald lives in Merna, but retains ownership of the old homestead. She has resided there some years, owns a pleasant home, and is in close touch with her children and her many friends, thus insuring a large degree of happiness in her later life. The family are highly respected and esteemed, being among the earlier ones of central Nebraska, where they have been identified with various measures affecting the general welfare and prosperity. Portraits of Mr. and Mrs. Hannawald will be found on another page. 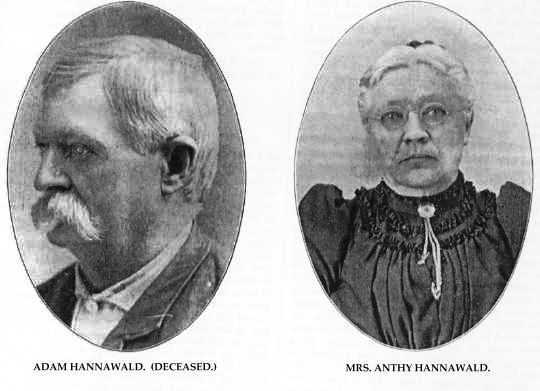 Adam Hannawald & Mrs. Anthy Hannawald. A typical pioneer of northeastern Nebraska is represented by the gentleman above named. He has lived many years in Nebraska, and has been a part of the growth and development of this region, building up for himself a substantial home and fortune by his perseverance and thrift, and has come to be one of the foremost citizens of Pierce county. William Buss was born in Wisconsin, March 9, 1868, and is the son of August and Wilmena (Krouse) Buss, both natives of the province of Pomerania, Germany, who emigrated to America. After landing in New York, the elder Buss went to Wisconsin where he rented a farm, on which he was living during the Civil war. He enlisted and served a short time, in a Wisconsin regiment, then returned to his Wisconsin farm. In the spring of 1871, the family came to Nebraska, settling in Stanton county, driving across Iowa by team, they having the only horses in the train of wagons, the rest having oxen. The claim on which they made settlement was situated one mile from the Wayne county line and three miles from Madison county line. The nearest market place was at Wisner, sixty miles away. On this claim they first built, a sod house and later one of adobe, in which they lived for seven years. During their residence there they experienced many hardships and privations, losing all their crops by the grasshopper raids of 1873 and 1874; and also in the blizzards of 1873 and 1888, for fuel they had at times to burn corn stalks and sunflowers. Our subject came to Pierce county, Nebraska, in 1893, and bought where he now lives, in section twenty-two, township twenty-six, range three, and has a fine farm well improved; he owns four hundred acres in Pierce county, and three hundred and twenty acres elsewhere in the state. Mr. Buss was married in 1893 to Miss Bertha May. They have had eight children: Martha, (deceased), Louis, Albert, Ernest, Arthur, Paul, William and Gustave. Mr. Buss is a member of the German Lutheran church and in politics affiliates with the democratic party. Paul Sorensen a prosperous and progressive farmer of Howard county, is owner of a valuable estate in section thirty-two, township fourteen, range eleven, who through thrift and energy, aided by a natural business capacity, has gathered about him an ample sufficiency of this world's goods, and is guaranteed immunity from want in his old age. Mr. Sorensen was born on September 1, 1849, in Denmark, and was the fourth child in the family of Soren and Karn Erickson, who had seven children, four boys and three girls. The mother died in her native land in 1867. Larke and Celia Sorensen, brother and sister of Paul, came to America in the following year, settling in Chicago, where they remained until 1871, and then came to Howard county, Nebraska, being among the very first settlers. In 1869, Paul also came over, stopping in Chicago, where he spent a few months, and then went to Minnesota, remaining one year. He then returned to Chicago and was in the city during the famous fire of 1871, which he remembers very distinctly, and can tell some interesting incidents connected with the castastrophe [sic]. During 1870, the father of our subject, two brothers, Christ, and Hans and two daughters, Hannah and Annie, also emigrated to this country, the whole family now being here, most of them settled in Howard county, Nebraska, all of the male members having filed on homesteads. In 1872 Paul joined the rest of his family in that region, and immediately took up a. claim of eighty acres on sections thirty-two, township fourteen, range eleven, which he has made his home ever since. He now owns one hundred and sixty acres of well improved land. He has a comfortable residence, and he also has an orchard, etc. In 1879, Mr. Sorensen was married at St. Paul, Nebraska, to Sine Jensen,, and they have had eleven children, nine of whom are living, named as follows: Emanuel, Ethiel, Walter, Ella, Annie, Holger, Eddie, Violet and Soren, all being intelligent young people who have been a great help to their parents in building up the home. scent and both his parents were natives of the state of New York. He was born in Oswego county, New York, October 21, 1853, second of the three children born to Robert G. and Emeline (House) Rowe, being the only one of the family now living. The father died at Beloit, Wisconsin, November 27, 1897, at the age of eighty-three years, and the mother died at Marengo, Illinois, in 1891, at the age of seventy-five years. Mr. Rowe accompained his parents to Dupage county, Illinois, when he was ten years of age, received his education in local schools there and after reaching manhood engaged in farming. On February 1, 1882, he was married, at Marengo, Illinois, to Miss Susan M. Stanford, who was of English birth and came to the United States in early childhood. Her parents, George and Susan Stanford, settled in Illinois on emigrating to America. In the spring of 1893 Mr. Rowe brought his wife and one child to Valley county and purchased one hundred and sixty acres of land on the southeast quarter of section thirty-one, township seventeen, range sixteen, which was his home for many years. Mrs. Rowe died there May 6, 1904, survived by her husband and three children: George R., now married and living in Valley county; C. Stanford, and Richard F., at home. On March 8, 1907, Mr. Rowe married Miss Mary Strathdee, their union taking place at Ord, Nebraska. She was born at Wilmington, Illinois, of Scotch-Irish parentage. The Strathdee family located in Valley county in 1885. The father, George Strathdee, was born in the parish of Ayrshire, Scotland, came to America in 1850, and died in Arcadia in May, 1910. The mother, whose maiden name was Mary Hurley, was born in Ireland and now lives at Arcadia. Two children were born of Mr. Rowe's second marriage, Curtis A. and Robert G.
Mr. Rowe is one of the most progressive men in the county and stands for the best interests of its citizens. He is always ready to support the cause of progress and advancement and has many warm friends. He now lives in a comfortable home in Arcadia and has retired from the farm. He was an extensive stock raiser and made a specialty of Poland China hogs. He owns three hundred and twenty acres of fine farm land in Valley and Sherman counties, which he has developed and improved. For several years he served as school director of district number eleven. Mr. Rowe experienced the life of a pioneer in a dugout residence in southern Nebraska and in Kansas. In 1894, the year of drouth, he harvested thirty bushels of wheat from forty-five acres and did better then than many of his neighbors. He is a member of the Congregational church and of the Modern Woodmen of America. In politics he is a progressive republican, though independent of party lines in all but national questions. Otto Borchers, a leading old-timer in Nebraska, resides on his well improved farm situated in section five, township twenty-three, range two, Madison county. Mr. Borchers is a typical pioneer, has lived many years in this section of the country, and has been a part of the growth and development of the region, building up for himself a substantial home. Mr. Borchers is a native of Germany, where his birth occurred August 29, 1838, in Hanover, province of Prussia; he is a son of John and Katie (Borcelman) Borchers, both also natives of Germany, where the father followed the occupation of farming. In 1863, Mr. Borchers came to America, embarking on a sailboat bound from Hamburg to New York, and was nine weeks and three days on the sea. After reaching the United States, he proceeded westward, locating in Minnesota where he remained seven years; here he worked as farm hand. In 1869 Mr. Borchers went to Council Bluffs, Iowa, and from there came to Fremont, Nebraska, where he went by stage coach overland to Madison county, locating on his present homestead, where he built a good log house, living in this ten years. During the first years of residence on the western frontier, our subject experienced many hardships and privations; during the first five years the grasshoppers that came every season and destroyed the vegetation were a great source of anxiety and disappointment. Mr. Borchers was united in marriage in 1869 to Miss Mary Olday, a native of Hanover, Prussia, and a daughter of John Olday. Mr. and Mrs. Borchers are the parents of six children, whose names are as follows: Katie, who is the wife of Henry Teke, and resides in Madison county; Adelia; John, who married Miss Mary Clyde, they residing in Madison county; Mary, who is the wife of Fred Preuner, lives in Madison county; Carl and Metta. Mrs. Borchers died January 19, 1900, deeply mourned by family and friends. They are a fine family, and are all active in forwarding the best interests of their home state and county, and are held in high esteem by all who know them. They are members of the Lutheran church and Mr. Borchers affiliates with the democratic party. Ansley, Nebraska. Mr. Simpson is a native of Woolverhampton, Staffordshire, England. born in 1839, and grew up on the farm where his father was employed - the large estate of a lord. Later he worked at mining in his native shire. He is son of William James and Anna (Wooley) Simpson, also natives of England. He was married in his native country, in 1867, to Miss Elizabeth Harris, also of English birth, and about 1869 or 1870 he brought his wife and one son to America. They located sixteen miles from Cleveland, in Cayhuga county, Ohio, where he carried on farming until 1879, when he removed to Hall county, Nebraska, and one year later, homesteaded on one hundred and sixty acres of land on section twenty-three, township sixteen, range eighteen, Custer county, which for many years was the home place. He became a successful farmer and was much interested in local affairs, helping to organize school district number sixteen. He is a good example of what may be accomplished by energy and thrift, and is a self-made man. He now owns three hundred and forty acres of fine farming and stock raising land, including a quarter section in Montana and twenty acres of fruit land in Oregon, and since 1897 has lived retired from active life, enjoying the fruit of his early toil. He has erected a comfortable home in Ansley and the family is well, known socially. To Mr. Simpson and wife eleven children were born, of whom eight are now living, namely: William J., married and living in Montana, has seven children; Anna E., who married Louis Duxstad and has one child, lives at Ansley with her father; Alice M. married Newton Draper, lives in Missouri, and they have seven children; Clyde J., at home; Frederick E. is married and lives four miles northeast of Ansley; Alma J. married William Burdick, of Custer county, county, and they have two children; Lottie M. married James Van Zant, of Westerville, Custer county, and they have two children; Leah E., at home; Rose H., who died in 1908, is survived by her husband, Lemuel Clay, and one child; and Albert E. and Minnie N. are deceased. Mr. Simpson is a man of stability and integrity and is considered a useful, public-spirited citizen. In politics he is independent of party lines. While in England he was a communicant of the established church. In Ansley he became identified with the Christian church. In compiling a list of the self-made men of Wayne county, Nebraska, who have become well-to-do, progressive farmers, and who have aided materially in the development of the agricultural interests of this region, a prominent place is accorded the name of Lorenz Albertsen. For many years this gentleman has been located on section twenty-eight on his valuable estate, and his agricultural operations have been extremely successful. He is known as one of the prominent substantial citizens of that locality and well merits his high standing. Mr. Albertsen is a native of Schleswig-Holstein, Germany, where he was born in 1840. His parents, Hans and Mary Albertsen, were farmers of that locality, and he obtained from them an intimate knowledge of intensive farming, which is one thing that has made the European farmer so successful as a general rule, even under what are considered very poor conditions in our favored land. Lorenz Albertsen saw military service in the war between Denmark and Germany in 1863 and 1864, and after the war was over could not settle down contentedly in the narrow community where he had spent his previous years. About March 1, 1865, he left his native land, and came to America to seek his fortune in this land of golden opportunity. He came first to Davenport, Iowa, where he remained about two years and a half. He continued his wanderings in 1868, when he went to California and remained about a year and eight months. He then returned to Nebraska and settled down in Saunders county on section sixteen, township sixteen, range seven, where he remained until 1889, when he came to Wayne county, and bought the farm where he now lives. His years in Nebraska as a settler were not entirely pleasant and encouraging. The grasshoppers took all of his crops for several years while he was, in Saunders county, and the prairie fires in summer, and severe blizzards in winter were also elements to be reckoned with. However, he persevered in his attempt to make a home for himself and his family, and after years of toil is now enjoying the rewards of his labor. He owns one hundred and sixty acres of land, which is the amount he purchased on coming to Wayne county. He has built his present comfortable home, barns and other out buildings. He has fatted a number of cattle and hogs, but of late has given of hard work, and is taking life easier in his old [a]ge. In 1879, Mr. Albertsen was united in marriage to Miss Ebbie Schultz, and of this union have been born nine children, named respectively: John, Henry, George, Albert, Minnie (now Mrs. Fred Adams), William, Arthur, Elsie, Emma and Fred. Mr. Albertsen is a democrat.